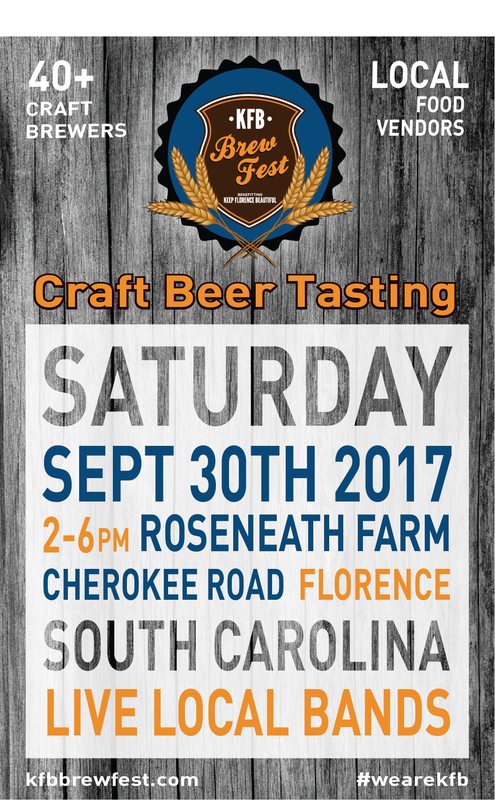 Keep Florence Beautiful will hosts it’s Sixth Annual Brew Fest Fundraiser on Saturday, September 30 2017 from 2 until 6pm. Tickets are 25$ online or 30$ at the gate. *Designated Driver tickets are also available online ( 15$, you will be required to wear a wrist band during the event). Wine and Craft Beer Samples will be available, and the event will feature local food vendors, artists, and musicians.. Tv’s will be setup airing the Clemson & Carolina away games. Once again the event will be hosted at Roseneath Farm [1102 Cherokee Rd] Florence, SC. Ticket sales from the event help Keep Florence Beautiful, a local non-profit organization with the mission of improving the community through beautification projects and recycling initiatives. Sponsorship Opportunities are available, click to download the Sponsor Guide. What if I don’t want to miss the college Football games? …We’ve got you covered! We’ll have a couple large screen tvs so you can catch all the action of the big game while enjoying some damn good beer! Is it Dog Friendly? …At KFB we are all dog lovers but we ask that you leave your dogs at home for this one.. let ’em hang out on the couch, turn the tv on and give them a day off. What is the Age Limit for this event/Can I bring my kids? …This is a 21 and over event PLEASE leave the kids at home (with a sitter, or with your dog on the couch 🙂 ). Join us for some grown up fun! What if I’m not a fan of beer?…Join us anyway! We will have lots of beers you may have never tried, some non-traditional types of craft beers. It’s a tasting, so if you don’t like it you don’t have to finish it. There will be well over 100 different beers for every palate. By the way: There will also be various wines for tasting – so if you cant find a beer you like come for the fun and try some of the wines we have to offer. Where do I park? …Parking will be across the street (on Cherokee)…better yet : get a ride , commute with friends (and your DD), or ride your bike. Cab Service will be available/on standby to get you home after the event. Why should we attend? …Because its a unique and cool event! There will be lots of people to see, great music, great food, its for a good cause…and of course GREAT BEER. This is our 6th event and we are sure to have fun, join us for one of Florence’s best-coolest-neatest events. Will there be Food?…Yes! Wholly Smokin’ will be there with their world famous BBQ and the 4 Cheese Spicy Mac & Cheese. Also the Brooklyn South Food Truck will be there with some great options to choose from…bring some cash and try some of our best local eats! Will there be Music? …Yes! Enjoy two live bands all day: Yellow Drama, and The Naked Bootleggers. Both local to the Florence Area. Will there be Wine? …Yes! There will be wine at our event for tasting. Price included in your donation/ticket cost.